No one wants to be a tourist – not even tourists. It has connotations of uncritical consumption, of high prices and low quality, of being mindlessly funnelled amid a mass of humanity towards the sorts of joints that real New Yorkers or Londoners or Parisians wouldn’t be caught dead in. The success of any experience of an unfamiliar city is measured by how much it overlaps with a local’s, and that’s never been truer than now. As cheap flights flood Europe with visitors, measures against tourists’ obstructive, destructive impact have been taken in Venice, Barcelona, Rome and most recently Amsterdam. There’s never been a more desirable time to pass for a resident. But how do you know where the locals go – especially when they may prefer not to tell you? By mining their publicly available data, of course. Computer scientists at ITMO University in St Petersburg say they have developed a way of using Instagram to “create a ‘locals’ guide’ … that is as genuine as it gets”. They analyse residents’ posts on the photo-sharing app to identify the city’s hidden gems, then share them with tourists. They have developed an algorithm that aims to distinguish between photos publicly posted by locals and those posted by visitors, and using the geotagging information to locate them both on a map. The result reveals at a glance the different haunts favoured by each group, “thus helping the locals to indirectly advise tourists”. While tourists will no doubt be delighted to bypass the holiday rite of passage that is buying just enough at Starbucks or McDonald’s to justify using the wifi to Google “best cafe St Petersburg”, the benefits of this advance for locals are less clear. To weed out the tourist photos, the researchers only analysed photographs posted last year in February and November – the months with the least tourist activity in St Petersburg – and omitted those posted within a probable holiday period or tagged at any of the 15 most popular tourist sites. 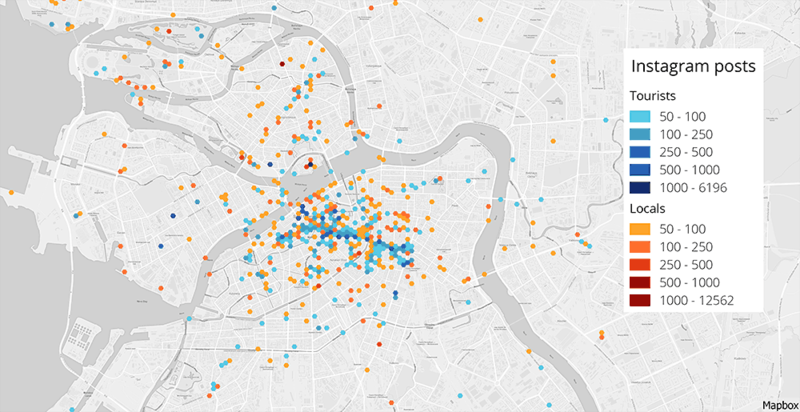 The final dataset consisted of roughly 530,000 posts with geolocation tags in 17,921 places, and 23,596 users classified as St Petersburg locals. Their posts were then divvied up into five categories: theatres and museums, restaurants and bars, “interesting city locations” (such as bridges and streets), parks and “other”. What of the results? The Ice Palace, an ice hockey arena and concert venue, was found to be more popular with St Petersburg residents on Instagram than the historic Mariinsky Theatre, where some of Tchaikovsky’s masterpieces premiered. The algorithm also threw up the Alexander Column at the Palace Square, the Fontanka river embankment, Schastye bar and restaurant on Rubinstein St, and Mickey & Monkeys cafe as residents’ favoured haunts. The researchers said their findings, presented at the International Conference on Computational Science and published in the peer-reviewed journal Procedia Computer Science, could have significant benefits for tourists: a “method for revealing new potential attraction points for tourists in a large city”. Mukhina argued that one could be an improvement in relations between tourists and visitors. Her research had shown that tourists typically gathered around one main street – drawing their attention to spots popular with locals could redistribute them more evenly, easing crowds in the city centre. “The increasing popularity of non-tourist districts will inspire the city administration to develop the urban infrastructure more actively and will spark business development in those areas – so redistribution of tourists will allow developing the city evenly, as opposed to focusing on two or three main streets in the city centre. Mukhina and her fellow researchers said the algorithm could be improved in future by taking into account engagement, such as favourites or comments, as an indication of interest in a photo. They eventually hoped to use it to inform a recommendation service that would update in real time. Whether this would have significant impact on locals’ experiences in St Petersburg, of course, would depend on how well its findings were publicised. After all, tourists’ activity is not just propelled by a quest for authenticity: marketing budgets play a role, too. But St Petersburg residents concerned about unknowingly sharing their quiet coffee corner with out-of-towners may like to consider making their Instagram profiles private – just in case.